Police in Indonesia have seized five Komodo dragons and other endangered animals that were being illegally sold on Facebook. A police spokesman in East Java said five suspected smugglers had been arrested in Semarang and Surabaya. 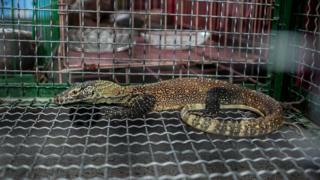 The reptiles were being sold for up to $1,400 (£1,000) each, officials said. Komodo dragons are the world's largest lizards. They can grow up to 3m (10ft) long and have razor-sharp teeth and a poisonous bite. The lizards, found on only a small group of Indonesian islands, are endangered in the wild and protected by international law, but are sometimes illegally smuggled as exotic pets. Is Komodo dragon blood the key to new antibiotics? "The suspects sold the Komodos online through Facebook," police spokesman Frans Barung Mangera said in a statement. The smugglers confessed to police that they had already sold more than 41 of the reptiles, said East Java police director Ahkmad Yusep Gunawan. If convicted, the traffickers could face up to five years in prison and heavy fines.